Did Differing Philosophies Drive Anthopoulos Away from the Blue Jays? Why? Why would Alex Anthopoulos abandon a team that enjoyed its most successful season in over two decades? Why would he exit after team ownership tried it’s hardest to keep around? 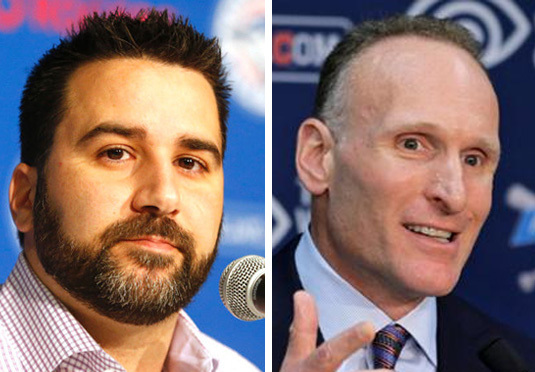 It’s no coincidence that Alex Anthopoulos walked away from the Toronto Blue Jays organization just as Mark Shapiro is set to walk in as the new Blue Jays president. To me, it signals that the two may have had vastly differing philosophies, which may have led to Alex Anthopoulos’ departure. Admittedly, AA has always been an incredibly tough guy to read. He very rarely tips his hand towards his true feelings or inclinations. But in listening to his lengthy interview with Bob McCown on Prime Time Sports, Alex Anthopoulos hinted at a few things. My first takeaway from this interview; in his heart of hearts, Alex Anthopoulos did not want to walk away. This was an organization he highly revered and thought of very fondly. This was the job for me. There wasn’t going to be a better job for me. There’s no team that was going to be better for me than the Toronto Blue Jays. So what suddenly changed? If this was the job for Alex Anthopoulos, why was it suddenly not the “right fit”? The simple answer is Mark Shapiro. That’s not to paint him as a villain or the sole person that drove Alex Anthopoulos out of the loving arms of Blue Jays fans. But things down at 1 Blue Jays way were going to be much different as of November 1st. Imagine having free reign of your family’s cottage every summer. Your fun-loving uncle lends you the keys and basically lets you have complete freedom of the place. But then your other uncle unexpectedly takes possession of the place and suddenly things aren’t so loosey goosey anymore. Now there’s accountability, you have to pay for groceries, boat privileges have been severely limited and the liquor cabinet has been locked up. You’re still allowed at the cottage, but the two uncle’s ideas of “fun” couldn’t be any more different. My guess is that’s how things have changed in the Toronto Blue Jays front office. 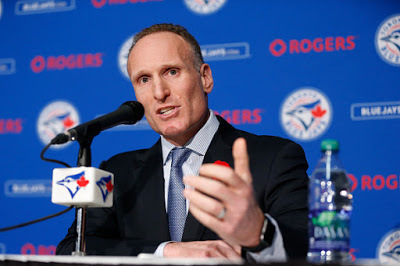 Instead of Alex Anthopoulos having a vision of this team and relay it to Paul Beeston and let him take care of the business side, Anthopoulos was going to have to follow Mark Shapiro’s vision. 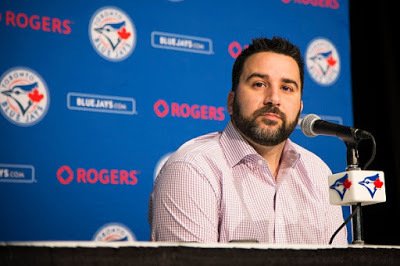 And after 12 years within the Toronto Blue Jays organization and the past six as the General Manager, Alex Anthopoulos probably had a very distinct and clear vision of where he wanted this team to go. After finally making it to the postseason, there was a sense the club had finally turned a corner. It was something the entire front office staff has worked incredibly hard to achieve. And with a new incoming president who’s very much a part of baseball operations, the entire plan Anthopoulos put in place was in jeopardy of being drastically changed. After six years, I’d say most had become familiar with Alex Anthopoulos philosophy to running a baseball team. But what was Mark Shapiro’s philosophy going to be? During his time with the Cleveland Indians, they weren’t really a team that pursued big name free agents or delved out big contracts to players. The Indians didn’t make splashy trades; instead, they drafted and developed and often made smart trades for the future. Admittedly, I’m not all that familiar with Shapiro’s work, but if I had to compare his style as a baseball executive I would liken it to those early years of Alex Anthopoulos’ time as GM of the Toronto Blue Jays. But it wasn’t until this year that we really got to see the true AA and what he was capable of. He wasn’t necessarily given carte blanche, but he was much more active leading up to and during the 2015 season than any season prior. AA’s decision to leave this organization is one that’s going to puzzle a lot of people for a very long time. It almost seems idiotic to walk away from ownership that wanted him here long-term and a team that’s poised to do some incredible things. I think I get it now and I think most fans will understand, too. It’s not about money and it’s not about term; it’s all about control. It’s about laying the groundwork for something spectacular, having it be wildly successful, and then having someone else come in and second guess basically everything you’ve already built up. Listen, we’re all creatures of habit; we don’t like change, especially if things are working extremely well. I’m not suggesting Alex Anthopoulos was adverse to change or direction under Mark Shapiro, but Alex clearly had one specific vision for this team and Mark had a completely different vision. Otherwise AA would still be here. Alex was a big proponent of character; not only within the Blue Jays clubhouse, but the front office staff as well. He made it a point to emphasize how important it was to him to be surrounded by people he enjoyed working with. “The other component is the people you work is probably as big. That’s what these jobs are about. Again, you’re here to get a job done and win, that’s everyone’s mandate. But because you spend so much time away from home and you travel and there’s so many long hours; the people you work with is such a critical component. Alex Anthopoulos is only 38 years old, but at this point in his baseball career, he doesn’t and shouldn’t have to make sacrifices anymore. Compromises which are often made early in one’s career are out the window. At this point, one can afford to be picky and not settle for anything less than exactly what they want. And that’s precisely what Alex Anthopoulos did by walking away from the Toronto Blue Jays … and I can’t really blame him for it.